Over 600 of the finest media and creative talent in the North came together last night for a triumphant hosting of the first ever Prolific North Awards. Held at The Point at Lancashire County Cricket Club, it was difficult to imagine a more extensive industry gathering in recent times. 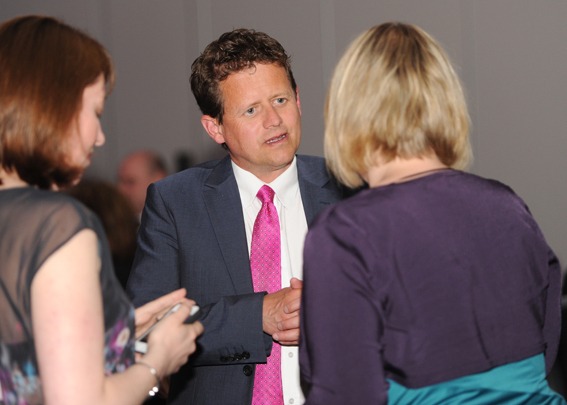 In all, 57 tables were booked up with at least 150 different companies and organisations represented from all corners of the region, from small agencies to national broadcasters. Hosts Jim Hancock and Beccy Meehan expertly oversaw a crowd that grew pleasingly more rowdy as the night progressed, with the main screen Twitterfall - orchestrated once again by KMP Digitata - giving a very public airing to all #prolificawards tweets... as well as a sin-binning for serial social offenders. After a drinks reception and a superb three-course dinner, the awards part of the night arguably belonged to Manchester agency Stein IAS, who took home three awards, but special mention should also be given to the city of Liverpool, whose representatives excelled themselves to walk off with a whole array of 'big Ns'. There was a fairly steady procession of Scousers to the stage for the first few awards of the night. The opening prize, for Best Animation/Graphics Company, went to Milky Tea, with the judges pointing to the fact that "with no capital investment they have created opportunities out of nowhere". "They are a company that is certainly going places", the judges agreed. A total of eight nominees were vying for the title of App of the Year, and after some fairly creative pronunciation of one or two of the entrants from host Jim, the top prize again went to Liverpool, this time mobile app developer Apposing. Its Bill Angel app for Carphone Warehouse - which allows users to track their texts and call usage - has already been downloaded over 150,000 times, far outstripping the client's targets. "Apposing have very much met a consumer need and can produce data that can make a huge difference to a client's business," the judges commented. There was an impressive mix of old stalwarts and new blood up for the title of Digital Agency, and it was one of the young pretenders, Tokyo Digital, that walked off with the top prize. Guaranteeing that yet another red, shiny, perspex 'N' would be disappearing down the M62, the judges highlighted how in securing a client base that already includes Google, Disney and the BBC, Tokyo "are punching above their weight" and demonstrate an "ability to win clients that would normally go to a London agency". Wresting some control of events back to Manchester, the award for Independent Production Company went to Blakeway North, a Ten Alps company that had impressed the judges with "their mixture of work over different genres and their multiple commissions over different channels". The Live Event category again featured eight nominees, such had been the strength of the applications received, with the eventual winner named as Peppermint Soda - recently rebranded from Peppermint PR - for its live streaming of a hair transplant at the Farjo Medical Centre. Praising a "great and bonkers idea", the judges said it was "a technically difficult event but very well executed". 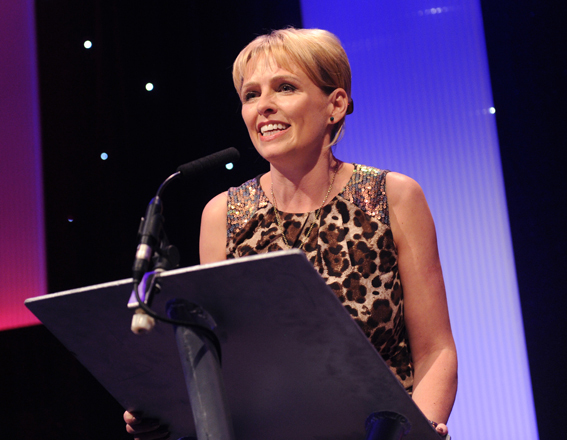 Next up was Best Magazine, which featured the irony of one of the editors of the nominated magazines, Louise Taylor of Cheshire Life, picking up the award on behalf of the winning editor, Lancashire Life's Roger Borrell. Congratulations on your restraint and graciousness, Louise! Judges liked the way a strong strategy "has seen them become editorial and photo led rather than loading up on advertisement". Cube3's vociferous table would have run away with the loudest cheer of the night prize, but in the end fellow nominee CheethamBellJWT's innovative campaign for John West, which allowed consumers to trace the origin of every can of John West tuna, was the winner in the B2C Marketing/integrated communications campaign category, with judges hailing the way the agency had uncovered an "unexploited opportunity that they really went to town on". The B2B Marketing/integrated communications campaign award went to Stein IAS, nominated an impressive three times in this one category. The judges eventually plumped for its work for The Institute of Contemporary Print, particularly appreciating the way Stein had made "a traditional and humble tradeshow work across digital, social and PR platforms... they were able to create a real buzz and stand out presence for the brand". The Creative Agency prize was a real battle between some big-hitters, and it was Stein IAS - making it a hat-trick of awards for the night - who triumphed. Describing the agency as "a proper northern company" that had "stayed true to northern social values", the judges pointed to its revenue doubling over the past year and commented that Stein was "the story of the year". 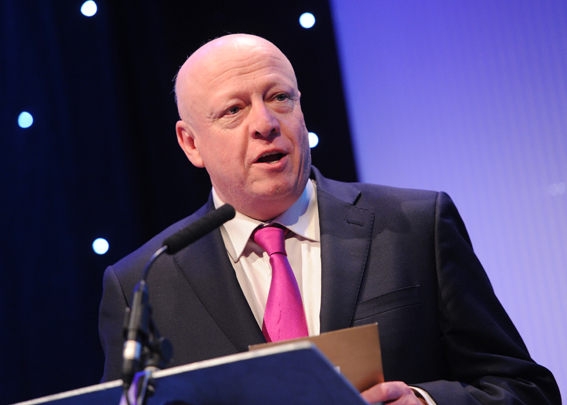 Well-known industry figure Martin Anderson was on hand to present the Media Agency prize to MEC Manchester, with judges impressed by its "growth of profit, turnover and margins" over the last 12 months, as well as liking its focus on staff welfare. Taking advantage of the opportunity to say a few words, deputy MD Emma Slater spoke passionately about how much the award meant to MEC. The Media Sales category was awarded to ITV, with judges pinpointing how it had become "more strategic" after a successful restructure, resulting in over "200 new or lapsed advertisers" using the broadcaster. Special mention was made of the tie-ups with the Welcome to Yorkshire Tourist Board and Emmerdale. 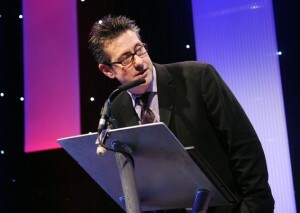 Neil McIntosh, managing editor of BBC Online & Red Button, was on hand to present the next prize, for Media Website. Bay TV Liverpool took home the award, with judges recognising it was "becoming the mainstream news provider on their patch" and had "bravely" taken on much larger corporations. Judges pointed to both the user-friendliness and responsiveness of the site. 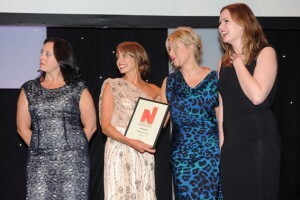 Rule 5 has only been in existence for six months, but that did not stop it walking away with the Best Newcomer award, with judges stating how it had "made noise and become a recognised player in the market". From starting with just two clients, Rule 5 "has added over £50,000 of new business in four months" and is set to break even in its first year. In the first of two PR agency categories, Roland Dransfield was presented with the Small PR Agency prize by Sally Sykes, director of external affairs at EEF. Judges liked the way it "successfully spotted commercial opportunities which are then fully taken advantage of with interesting approaches and outcomes". 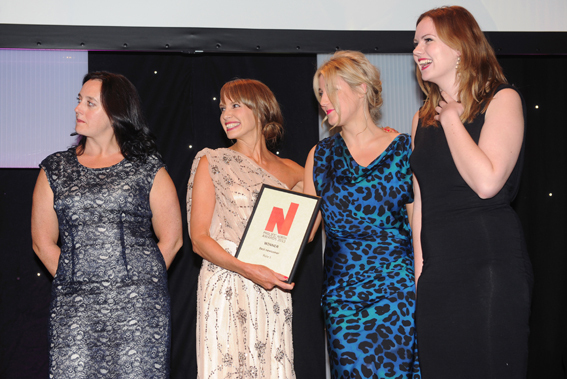 Accepting the prize, managing director and founder Lisa Morton paid tribute to her team and the sacrifices they had made to survive the recession: "We lost no staff but we've had no pay rises and we stuck together," she said. The Large PR Agency category was hotly contested, and not just in the way each nominated table attempted to out-holler each other. 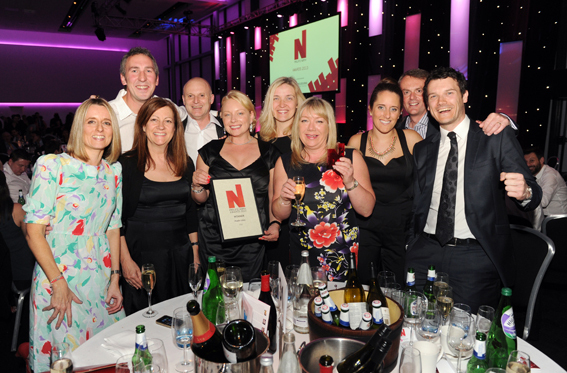 The award went to Citypress, with the judges describing them as a "terrific Manchester agency" that had "managed to gain nine new major clients in 2012 whilst maintaining a 95% client retention." 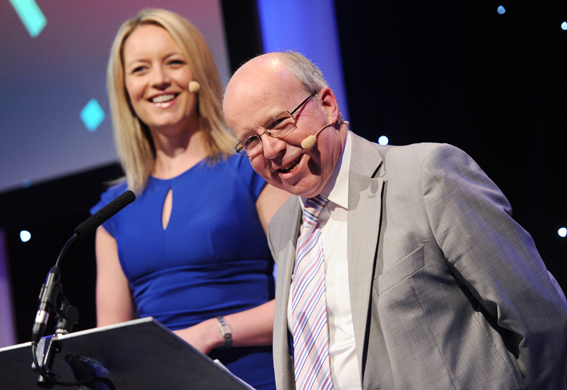 The Radio Station category was the only one to feature two awards, with the judges feeling that Kendal-based community station INDIGO 106.6fm was deserving of a Highly Commended prize due to "their excellent local community engagement... They are the definition of a local community radio station." That meant Global Radio was assured of the top prize, and it was 97.7 XFM Manchester which took the honours. "They have established themselves as a credible, relevant and successful player in Manchester," said the judges, "it’s only with their persistence and style they have succeeded to where they are now." Andy Barke, Industry Head at Google, was up to present the next prize, for SEO & PPC Agency. The name of Manchester's theEword came out of the golden envelope, with judges highlighting the agency's "outstanding commitment to driving themselves forwards not only commercially but through the work they do within the local Manchester community". 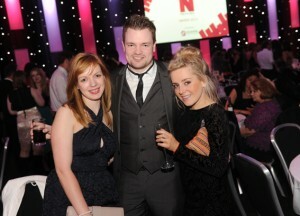 The Social Media Agency category again went to Liverpool, this time to Rippleffect. Judges called the agency "a true Merseyside growth story", and pointed to "great results for their wide variety of clients". Finally, the awards part of the night was brought to a rousing close as TV writer Paul Mousley presented Nine Lives Media with the prize for TV Programme. My Life: Me, My Dad and His Kidney has already been recognised with a Children's BAFTA, and the Prolific North judges saw no reason to disagree. "This was a piece of programming that went beyond the usual visual broadcast," the judges commented. "It was innovative, challenging and engaging and is now used by hospital trusts to help youngsters with this difficult topic." The awards were over, but the mingling continued with many retiring upstairs for a set from DJ Clint Boon. A huge thanks once again to headline sponsors Melbourne Server Hosting and all our other sponsors - Mustard, Summ.it, Orchard, Better Placed, Amsys, Beever and Struthers and MMU - as well as our judges and all those who came. We hope a good night was enjoyed by all. 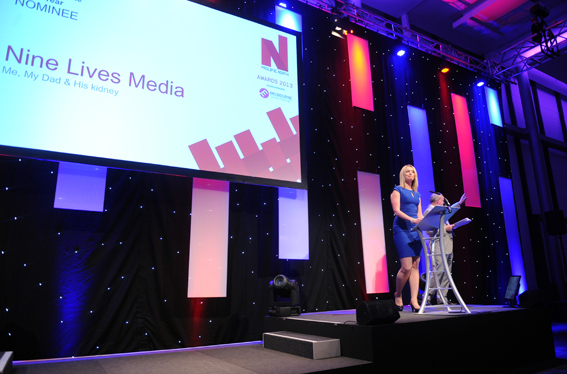 The full list of award-winners can be seen here, while don't forget that tickets are now available for the Prolific North Marketing Awards on July 3.